How can one go wrong with deep fried cheese wrapped in bacon? In medium bowl, combine milk and eggs; whisk until smooth. In another bowl, toss cheese curds with flour to coat. Place panko breadcrumbs in third bowl. Dip cheese curds in egg mixture; then roll in panko bread crumbs to cover. If curds need additional coating, dip again in egg mixture and bread crumbs. 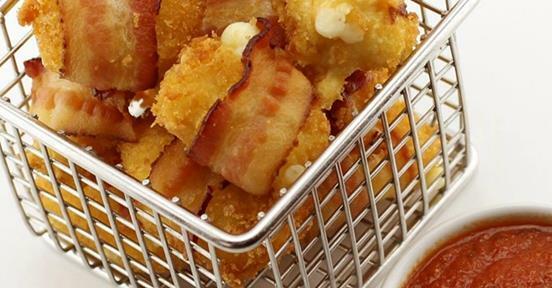 Slice each strip of bacon in half and wrap around breaded cheese curds. If necessary, use toothpicks to keep bacon in place. Fry cheese curds in batches for approximately 60 seconds each batch. Drain on paper towels. Serve immediately with marinara or your preferred dipping sauce.